The number of children with insurance coverage is falling as anti-immigration rhetoric by the Trump administration grows, according to a new report. For the first time since 2008, the number of uninsured children has increased, according to the report issued Tuesday by Georgetown University's Center for Children and Families. The number of uninsured children under the age of 19 nationwide increased by an estimated 276,000 to about 3.9 million in 2017. The rate of uninsured children ticked upward from a historic low of 4.7% in 2016 to 5% in 2017. One reason for the drop could be that a quarter of all children under 18 living in the U.S. have a parent who is an immigrant. These adults may be reluctant to have their children enrolled in coverage over fears of deportation, according to the report. "Several policies targeting immigrant communities are likely deterring parents from enrolling their eligible children in Medicaid or CHIP despite the fact that most of these children are U.S. citizens," the report said. South Dakota, Utah, Texas, Georgia, South Carolina, Florida are the states that saw the steepest drops over the one-year period. Medicaid Health Plans of America's and the Kaiser Family Foundation have also noted drops in Medicaid enrollment, but they say the trend is tied to rising employment rates and better wages. Georgetown officials expect the number of children who go without insurance will rise should the White House finalize a proposed public charge rule that would penalize permanent resident applicants for using Medicaid and other government safety-net programs. As many as 4.9 million individuals could leave Medicaid if that rule is finalized, according to the Medicaid and CHIP Payment and Access Commission. Pediatric hospitals will see their uncompensated care costs rise if more children lose insurance. 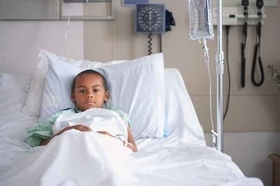 These hospitals account for less than 5% of the nation's hospitals overall, but they cover 53% of all hospital stays for Medicaid children with medically complex conditions, according to the American Academy of Pediatrics. Correction: An earlier version of this story had a headline that mischaracterized the latest figures on the uninsured rate for children. The headline now correctly reflects the data.